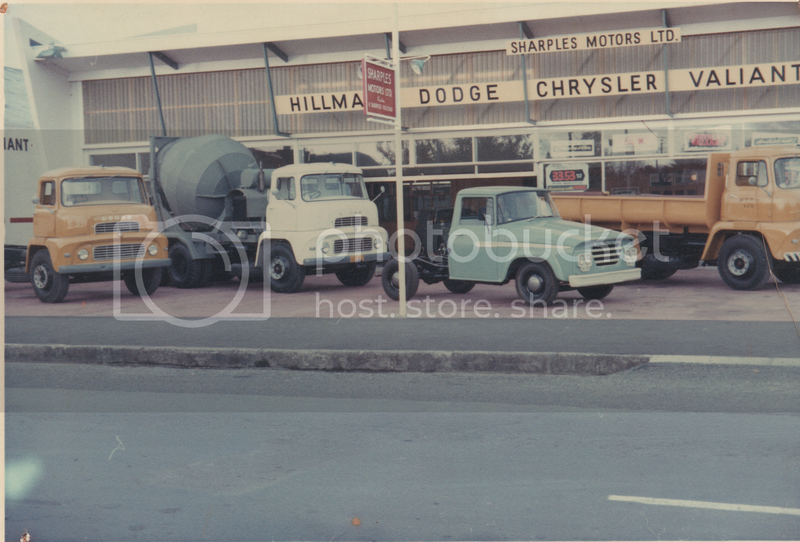 During the clean out at my work, we found these photos going back to the days when the previous company was a Hillman, Chrysler Valiant and Dodge dealership. 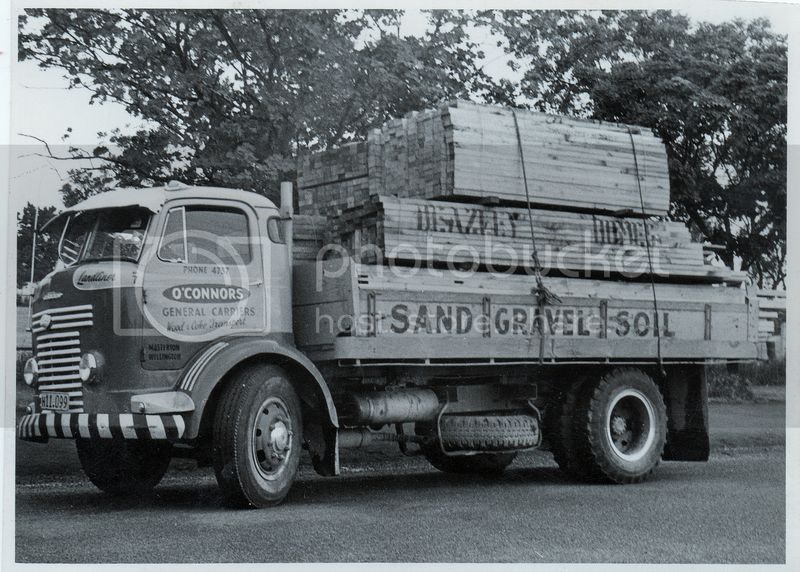 O'Connor's General Carriers Commer loaded up with timber for Beazley Homes. I think that this may have been TS3 powered, as I don't remember the petrol models having a vertical air intake, which has lost its lid, in this photo. 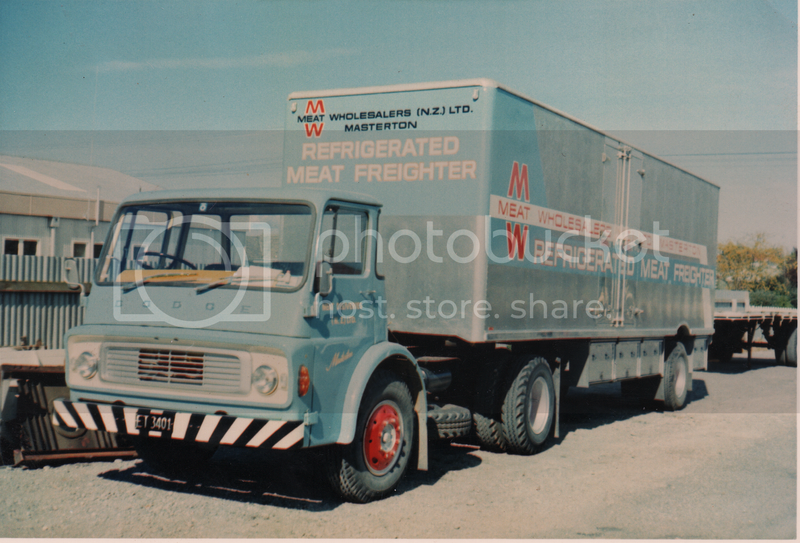 Meat Wholesalers Dodge I remember well, going over the Rimutaka Hill Road late in the day to bring back deliveries to the Wairarapa's butchers' shops during the night. Although the body was insulated I don't think refrigeration was a requirement then. This Dodge was powered by the 5.77 litre Chrysler V6 diesel which was an option to the Chrysler 7.7 litre V8 . In the UK there was also an option of the Perkins 6.354, but I don't think we got these in NZ. The V6 and V8 Chryslers were actually Cummins engines built for Chrysler's use. Later, this model of Dodge came out with the 510 (8.35 litre) Perkins V8 and the last series of this model was fitted with the larger 540 (8.85 litre) Perkins. The LAD cab Dodges were fairly common and were, from memory, Perkins powered, although I'm guessing there may have been a petrol option. UK models had an option of the AEC 7.7 litre diesel, but I'm not sure if this applied in NZ. 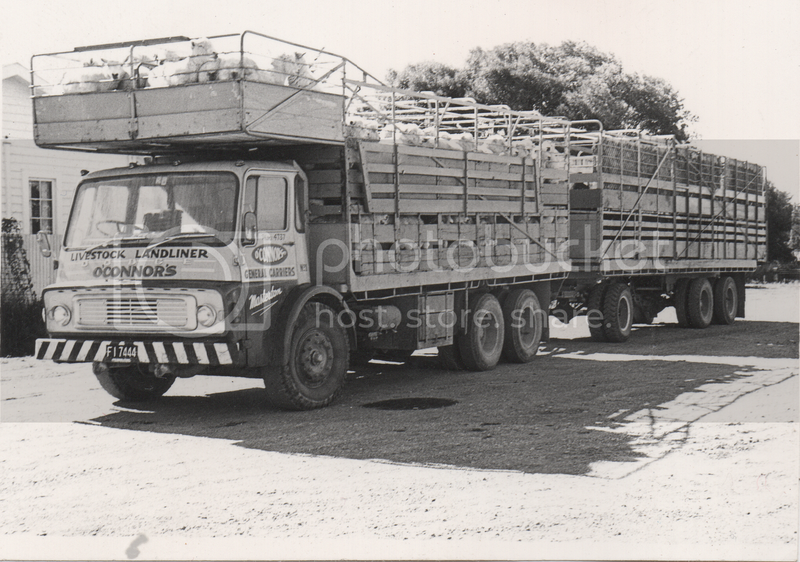 This variety of cab was called LAD because it was used by Leyland, Albion and Dodge, but I think it should have been monikered as LADS, as Scammel also used it on some models. I don't remember the model name of the smaller Dodge pick-up in the foreground, but I think I'm right in saying they used the same cab as Internationals of this era and were fitted with the Chrysler Valiant slant six motor. O'Connors again. This time a K model Dodge, which apparently was fitted with the Chrysler (Cummins) V6. 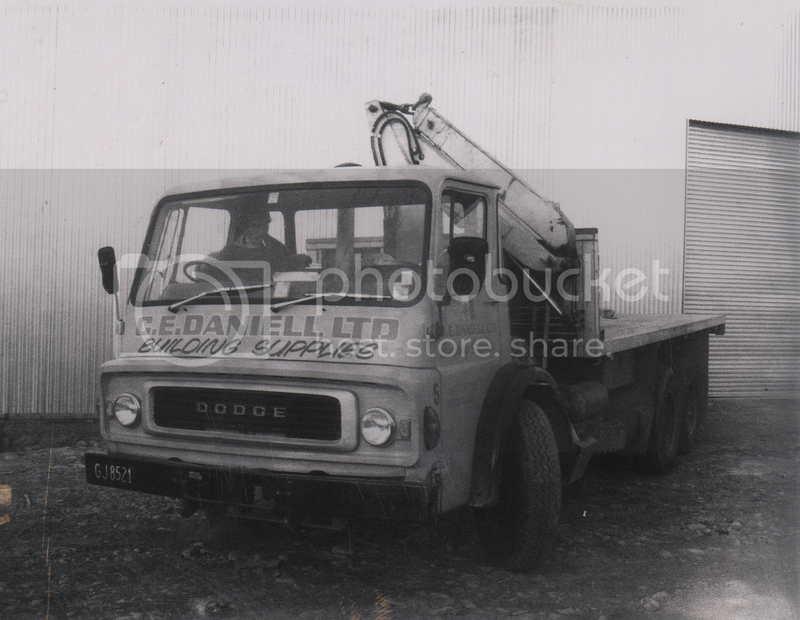 C.E.Daniell's saw mill, had this crane equipped tandem drive Dodge for timber deliveries. The different grille and larger mirrors, compared to the above photo, indicate that this is a later model and was therefore probably powered by the larger 510 or 540 Perkins V8. 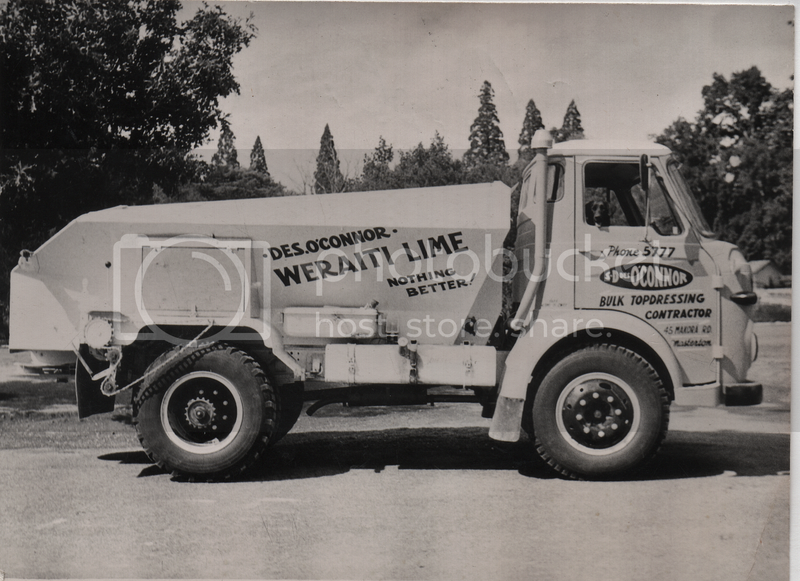 This Dodge lime spreader of O'Connors probably had the Perkins 6 cylinder (6.354). 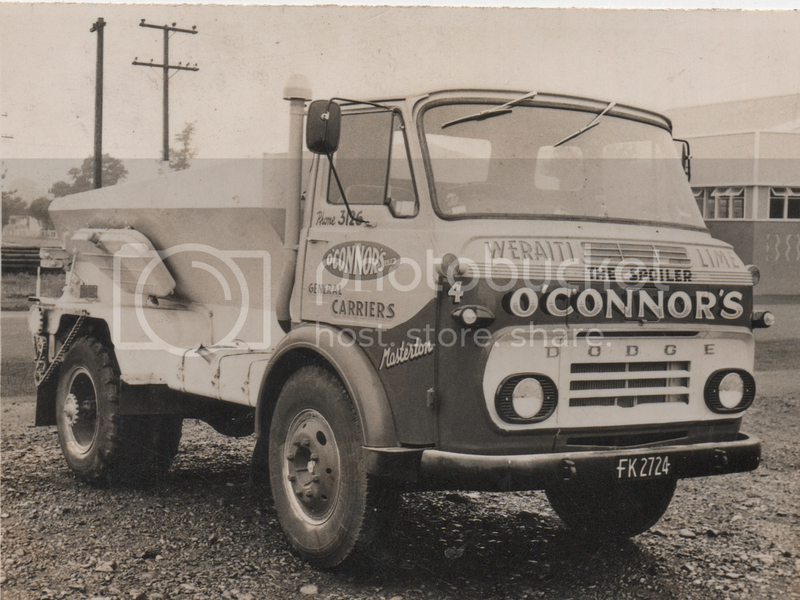 Although similar to the above vehicle, Des O'Connor was apparently a different operator to O'Connor's Carriers. Meat Deliveries I'm sure were probably connected with Meat Wholesalers. This Dodge would most likely have the 6.354 Perkins, but I can't be certain it is a Dodge as it has no badging. Commers used a badge engineerd version of the same cab with the same motors except for the two-stroke TS3 which was a Commer only option as far as I'm aware. TS3 Commers also had four headlamps, but I have seen some models which contradict this, but maybe that's due to repowering or or re-cabbing. Awesome Kiwi photo of the Dodge LAD cabs new at the dealer. This photo should go on flicker. It will be appreciated worldwide. Can you send me your contact email to c.porter@xtra.co.nz. 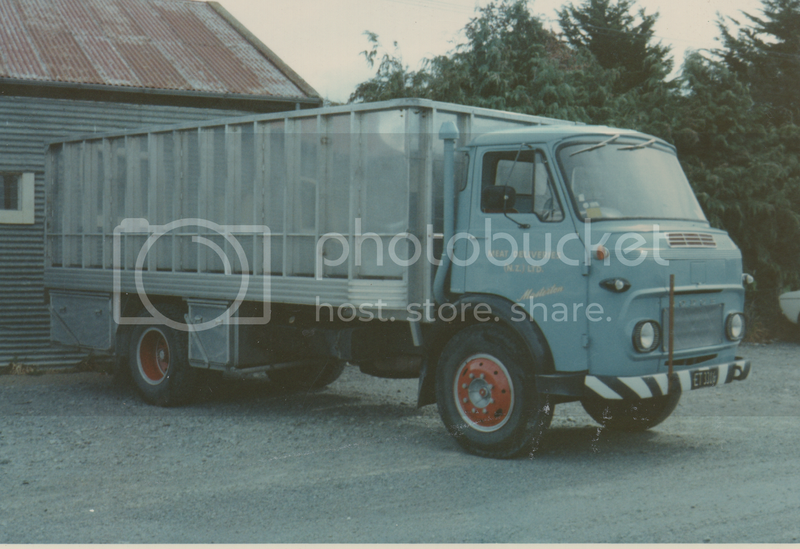 I belong to the LAD cab site at flicker under Porter1988 I have some Kiwi LAD cab Dodges on there in the same Klondike yellow owned by my late father. I recently purchased one with the 0.350 Leyland motor. Dad had a petrol one and the Perkins 6354.